This project, commissioned by Mr. Fong Yun Gao, is a meeting are for exhibitions as part of an Urban Theme Park in Ordos. The structure will be set within an urban park acting as a public promenade and open-air foyer providing shelter to the rest of the site. The design, influenced by the Ordos desert and it’s resonant sands, consists of two structures, one is a monocoque wooden frame construction using plywood to clad highly stressed parts of the internal frame; this skin provides strength in shear and compression. The fluid nature of the design reflects the changing landscape channeling light through the design via the folded atrium. The second part of the design acts as a harp, the pre-stressed striated steel frame is a sculptural element which may be clad in Teflon and fiberglass when necessary. 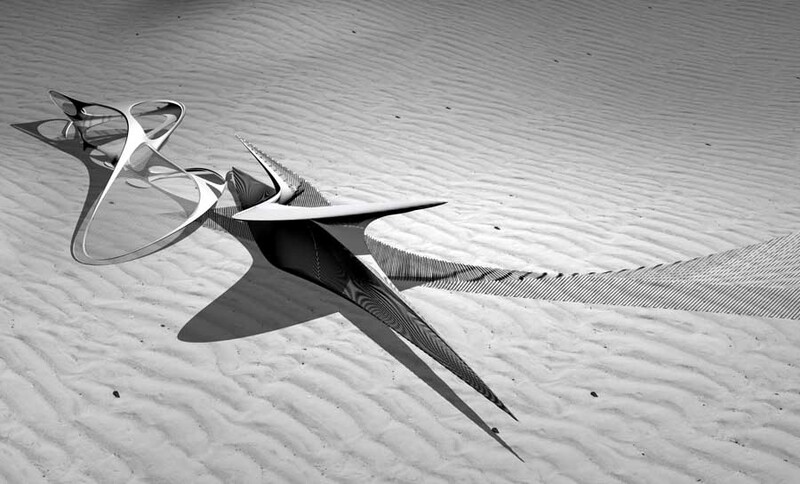 This sculptural element mimics the resonant sands of Ordos. Whereby the wind animates the design using the shelter as an instrument that can be controlled according to the type of cladding used. This project has been commissioned in April 2010 and the design stage has been completed, the project designed by Margot Krasojevic and engineers involved are Arups of London.